Ice climbing in North Carolina is akin to going on a big game hunt. At least that’s the analogy professional climber, instructor, and guide Karsten Delap uses to describe the Tarheel State’s fickle conditions. That search might include a very long walk through the woods in wind, snow, and freezing temperatures, with the distinct possibility that you might not find your quarry at all. But, when the ice is in, it’s more than worth the work. North Carolina’s combination of mountainous terrain and plentiful water are the ingredients of the best ice climbing meccas in the country. So, when the mercury drops, it pays to be ready. The ice and the ever-changing conditions over minutes, hours, and days add an ephemeral quality to the thrilling puzzle of ascension. From soft and pliable to rigid and plastic or tough and brittle, ice requires you to be tuned into your environment and interact with it. Sound intimidating? It’s more accessible than you think. Delap’s been on the hunt long enough to know Southeastern ice. He’s an American Mountain Guide Association-certified co-owner and head of alpine programs for Fox Mountain Guides & Climbing School in Brevard, NC. He also represents outdoor brands La Sportiva, Deuter, and Blue Water Ropes, to name a few. His ready response when asked to sum up ice climbing in the Carolinas—adventurous. Boots, crampons, and axes are included with guided trips. Due to fluctuating temperatures, trips can’t be scheduled in advance, so the client and guide stay flexible and in close communication to be ready to jump on a climb when the ice is in. A Southeastern ice climbing Facebook page provides another resource to monitor local conditions. North Carolina’s Black Mountains are home to Celo Knob, the location of the longest ice climb on the East Coast. But, western Carolina’s vertical relief provides plenty of options for any level of climber, including beginner routes off the Blue Ridge Parkway at Highway 215 near Brevard, Doughton Park, and Graveyard Fields. 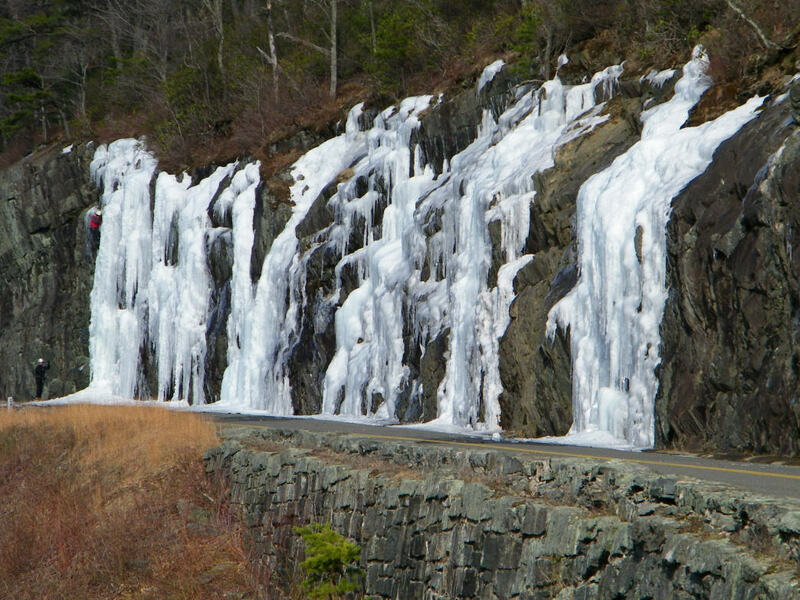 Other ice climbing areas, like Gerton near Bat Cave, Whitesides Mountain, and Linville Gorge, Winding Stair near Franklin, Sam’s Knob in Haywood County, and Big Lost Cove, typically have longer approaches, more advanced routes, or both. Another factor to consider is that some areas are off limits after January 15 due to peregrine falcon nesting activity. Another nuance that distinguishes ice climbing from rock climbing is the grading system. Ice climbing routes are rated on a water ice (WI) scale. Ice climbing grades are much more subjective than rock climbing grades, because weather conditions can change rapidly. 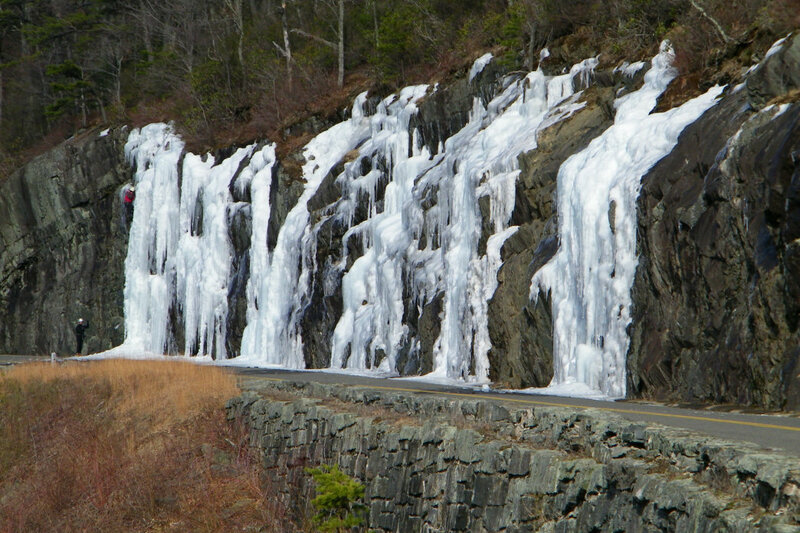 Depending on weather and sun exposure, and the grade of an ice route can rise or fall several levels. Generally, beginner routes are rated WI 1-3; intermediate routes WI 4-5; and advanced routes WI 5+. An ice axe might feel like the coolest and most essential tool to get started, but Delap recommends you focus on well-fitted ice climbing boots instead. While guides typically offer rental boots, they’re not molded to your feet the way your own pair of boots would be, and can become uncomfortable on the mountain. Otherwise, the usual cold-weather layering rules apply, meaning you’ll need a wicking base layer, warmth layer, and outer wind-resistant shell. A puffy parka is helpful, along with two pairs of gloves, a thinner pair for climbing and a thicker pair for belaying. Though most people get into rock climbing first because of the longer season, you don’t necessarily need rock climbing experience to climb ice.The sport doesn’t require anything more than a general level of fitness, though it doesn’t hurt to do some tricep work to strengthen your swing. Being able to hammer a nail with both left and right hands is a useful skill as well. If you combine proper movement technique with a skill-appropriate climb, you’re sure to have a great day on the mountain.